Are you looking for a way to make homework more engaging and meaningful for your students and families?! 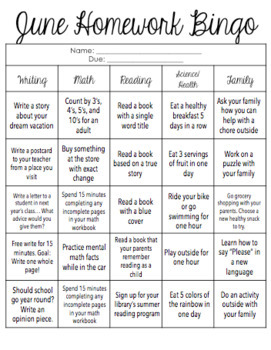 Homework BINGO to the rescue! 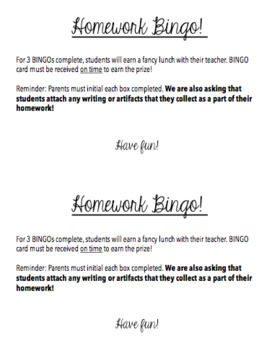 Homework Bingo makes homework more fun! Using this product increases student choice and includes activities that encourage family involvement. It's not only great for kids and families, it's also great for TEACHERS! No more weekly packets to copy and correct. Simply print on some fancy colored paper and call it good! 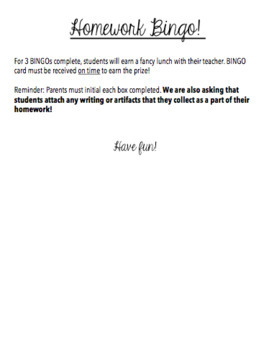 The Bingo squares in this purchase are already filled in and geared toward 2nd/3rd grade. However, this board is EDITABLE and you can change the Bingo squares as you need for you grade level or content. You can even attach math sheets or reading articles and create a square requiring students to complete the attached pages. If you have any questions, you may contact me directly at meaganbiestpt@gmail.com. Thank you so much! **Copyright 2019 by Meagan Bies. The purchase of this product entitles you to use in a single classroom. Graphics and content may not be copied and used in another product without permission from their creators. Thank you!